Service for shipments that needs to stay cool or frozen. 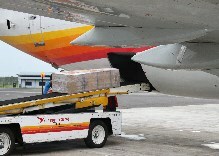 Surinam Airways cargo offers reliable transportation of fresh and cool cargo to and from all its destinations and beyond with other carriers or via trucking companies. Products like flowers, fish, vegetables, pharmaceuticals etc. are kept at the desired temperature.It is mandatory to inform the carrier and handling agent at what temperature goods should be kept.